It's the Year of the Dog and Valentine's Day—raise the woof! Even though dogs are human's best friend, please DO NOT bring your pets to the museum. Animals (except service animals) are not allowed inside the museum. • Bring an item to donate to the Hawaiian Humane Society, and get entered to win a prize! The Humane Society's wishlist can be found here. Representatives from the Humane Society will be at the event to answer questions about adoptions and all the work they do for Hawai'i's homeless pets! • Gee Yung Martial Arts celebrates the Year of the Dog with a traditional Chinese New Year lion dance in the Kinau Courtyard. • DJ Tittahbyte breaks it down in the Luce Courtyard—shih tzu is about to get real. 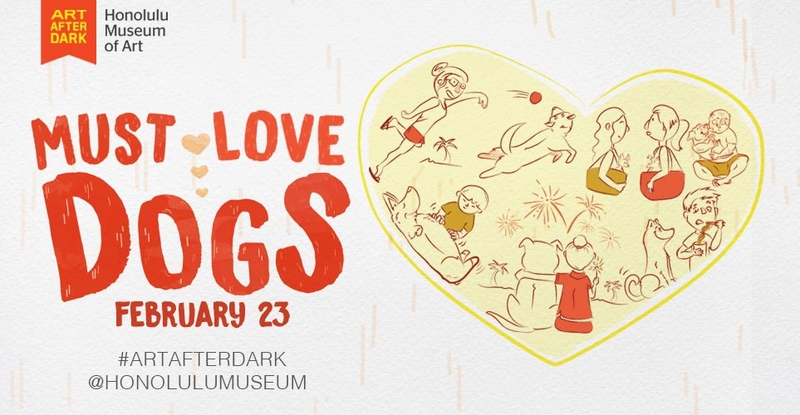 • Celebrate your "Puppy Love" in the Palm Courtyard by writing a Valentine to your favorite two- or four-legged friend! • Simple Souls bring their acoustic melodies to ARTafterDARK to get your tails wagging! *Note that the Portrait Artists and Behaviorist are by appointment only—get to the shop early to sign up for a time slot! • This month's specialty cocktail is the Red Lotus: New Amsterdam vodka and soho lychee liquor accent the tartness of cranberry to create an interesting play of flavors that is both intensely sweet and delicately refreshing.